The UN-SPIDER Recommended Practice on radar-based flood mapping explains the use of Synthetic Aperture Radar (SAR) satellite imagery for flood mapping. The practice shows the use of the European Space Agency's (ESA) SNAP software for pre-processing and processing of SAR imagery using a threshold method for deriving the flood extent. 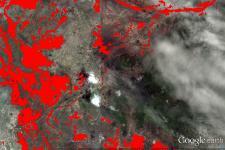 Google Earth is used to visualize the results of the image processing. This practice was developed by the Space Research Institute NASU-SSAU, Ukraine, a UN-SPIDER Regional Support Office. This practice can be applied globally and has been used successfully for floods in Australia, Africa and Asia. The practice was applied to the flood event in Malawi in January 2015. Since December 2014, heavy rains affected Malawi causing rivers to overflow. The recommended practices was applied to an affected area in the Nsanje district around Chiromo. This practice can be applied globally. It has been applied successfully for floods in Australia, Africa and Asia. The precondition for SAR water detection is a smooth water surface. False alarm can occur in areas of radar shadow due to variable terrain. False alarm can also occur with smooth objects like roads and sand. Flood detection in urban areas remains difficult. The detection of flooded vegetation from SAR imagery requires a different approach using two multi-temporal images.